This is the autobiography of the great yogi and meditation master Tsasum Lingpa. Born in Eastern Tibet in 1685, his mother’s name was Gelekma and his father’s name was Tashi. The birth of the great father and lineage master Tsasum Lingpa, proceeded in the following way. Through the power of inspiration, you became the gracious, crown jewel. I bow down to the lotus feet of the guide who showed the path of the Buddha to me in this lifetime, Ratna Karmabhadra. In general, when I closely [connected with] the tsa lung practices, I actually achieved the accomplishment of the “Vidyadhara of Immortality” (Tib. Chime Rigdzin). After this, I reincarnated as many other tertöns, such as Dumgya Zhangtrom, Bonpo Dragtsal, and Drimed Kunga, who revealed the vast and profound teachings, and made meaningful connections with everyone who met me within the six realms. I was born twice, [once] at Lholdrak and [once at] Moon, where I completed beneficial works for those areas. Then I went to the places called Dhagpo and Kongpo, which were very populated. I even had a place to live. I stayed there three years to complete all the beneficial activities. Afterwards, I went to Eastern Tibet. This is the brief story of my previous lives. This is the first chapter about he who obtained unforgetting wisdom, which never omits any of the details of these previous lives in all of their aspects. I bow the top of my head to the lotus feet of Yeshe Palbar. When she said this I was very comforted and became confident. I began to recognize this dancing dakini in front of me, but then I did not. I praised her and made offerings with folded hands and deep devotion, then I answered her by saying, “Please tell me who you are and what emanation you are.” When I said this the dakini answered, “I am the mother of all beings, Tsogyal Machig Labdrön. I have always accompanied you, my son. Are you confused? You are confused because your concentration is still up and down, good and bad. After one year you will meet [me, your] mother.” Then she instantly disappeared like a rainbow in the sky. At that moment my mind became relaxed and bright. Immediately the image of Padampa Sangye appeared in front of me and I remembered the instructions and practices, and prayed to him. Instantly from the heart center of [Padampa Sangye] emanated a beautiful blue lady with decorated, dark blue hair. She had a lovely complexion and smiled with very white teeth. She sang a beautiful song that I could barely hear and then said, “Touch your ring finder to mine and I will take you to your mother’s house.” Then she held my hand tightly and it felt like I went with her. Then I asked mother, “Who are you? Please tell me.” She said, “TAM TA TARE,” and we moved very quickly. I couldn’t recognize her because my mind was unstable. At that very moment I was in the very high mountains in a deep and narrow ravine. There was a big noise of a river and wind. Then a large tornado arose and I felt completely trapped. Instantly, I fell unconscious. After a while I slowly awoke. I did not see the lady who had been with me. Now I experienced the first stage of the bardo. Wherever I looked was completely colored red, and filled with jungle and tall mountains. It was very hot and rough, and everything appeared in different shapes. All of the forms looked as though they were about to get up and begin to talk. When I thought to walk, I could not move my body. It seemed like [my] earth element was dissolving into [my] water element. I thought, “Is this true? Is this a dream or the bardo?” When I maintained my mind in its own natural state, wisdom arose and I understood that this was the bardo. I thought that I was now definitely in the womb, so I reinvoked the creation stage practice of the yidam. I realized that this was not the same house that I saw before. Now it appeared as many houses and lands. My experience was similar to a rough dream, with happy and difficult situations rotating one after another. When I looked at my body again and again, I saw different forms that kept changing from what I had just seen. Then I was sure that I had definitely taken another birth. I began to question the experience of the bardo. I asked, “What is this country? Is this the city of the womb of samara?” Then I thought to myself, “If this is the womb then it must be the place of the mother,” and I began calling for my mother, “Ama lak!” When I called it seemed like someone was answering me, but when I looked in different directions I didn’t see anyone. Sometimes [things appeared] clearly and other times they were unclear. I had the feeling that I had stayed a long time in one place. Even though at that time I sang Dharma songs, I cannot remember them as clearly now, so I will not include them here. This is how I entered my mother’s womb. This is the second chapter about [being in] the bardo of the womb [searching for my parents]. I bow down to the feet of the only parents, Guru Rinpoche and Yeshe Tsogyal. Thirdly, [the location of] my birth place is in the northern direction of the Vajra Throne [Bodhgaya], and Kashi and Bamboo grove lands in the central land [of India] which was blessed by the victorious ones. From Mt. Kailash appearing as a crystal stupa, and passing through [the eight glacial mountains of Tibet], the whole area has the geological formation of a female cannibal lying down. The victorious one [Buddha Shakyamuni with his 500 arhats] came and blessed these places, made predictions, and miraculously left their hand prints. [Among these places,] the white glacial Mt. Kailash (Tib. Tise) has great, supreme qualities, and appears as the crown chakra of the great blissfulness. The glacial mountain Lachi looks like a mandala filled with many precious offerings. This is where you can reach enlightenment within a single lifetime even without meditating, and with [its] great qualities, this holy land is the speech chakra of enjoyment. Lhasa and Samye look like 1,000-spoked wheels where the ocean of the vidyadharas and siddhas came with supreme qualities. They are the heart chakra of the Dharma. [The mountains] Dokham Zalmo [and Jowo Zegyal] are holy lands that appear like a heap of precious jewels, and were blessed by Buddha Guru Padmasambhava with supreme qualities, as the navel chakra of emanation. Rongchen glacial mountain looks likes the opening points of a vajra. Many noble bodhisattvas and great beings blessed this land with supreme qualities as the secret chakra that preserves great blissfulness. Similarly, toward the southern part of the center of the world and universe is the amazing holy place of Vajravarahi. This land’s name is decorated with the glorious sounds of the alphabet Pa and Kha. Kha is the head letter of all of the Tantras. The Palgyal Rinchen mountain looks like lions jumping up in the sky. Here the Zachur River and the Chi Char River join together like the [union of] the Sutras and Tantras. The Palkha and Tamka [Rivers] are like the rolma and changma channels, and Palchu Kangha looks like a stretching central channel. When you view the land, all of the formations of the area look like the whole universe is open. The mountains look like majestic, dominating elephants rearing up. The right mountain looks like a jewel throne. On top of that, Jowo Zegyal mountain sits like a king. On the left side, there are rolling waves like rivers at high tide. The Kugyal Shenne mountain looks like a yogi or ngakpa [who] is charging, subduing negative forces, and so forth. This whole area is filled with holy cosmic formations, blessed by numerous holy beings, where so many lineage holders of Sutra and Tantra came. In the slope of the deep valley, in very ancient times it was known as the Land of Demons, where many negative forces were subdued. Still, there are many scavengers like jackals and wolves that make very scary noises. The trees, bushes, and grass are pointing up like weapons. The black rocky mountains look like male and female warriors that are very angry and charging at others. There are many black birds flapping [their wings], making empty noises. It is a frightening valley mountain that is blessed and sealed with the symbols of Gya and Tag [in the mountain rocks]. There are glorious formations of rivers flowing with echoing wind. The area looks like a black iron scorpion that is lying on its back. Right on the center of the scorpion is [my] predicted birthplace. This [third chapter] is a description about the formation of the place where I took birth in the Land of Snows. 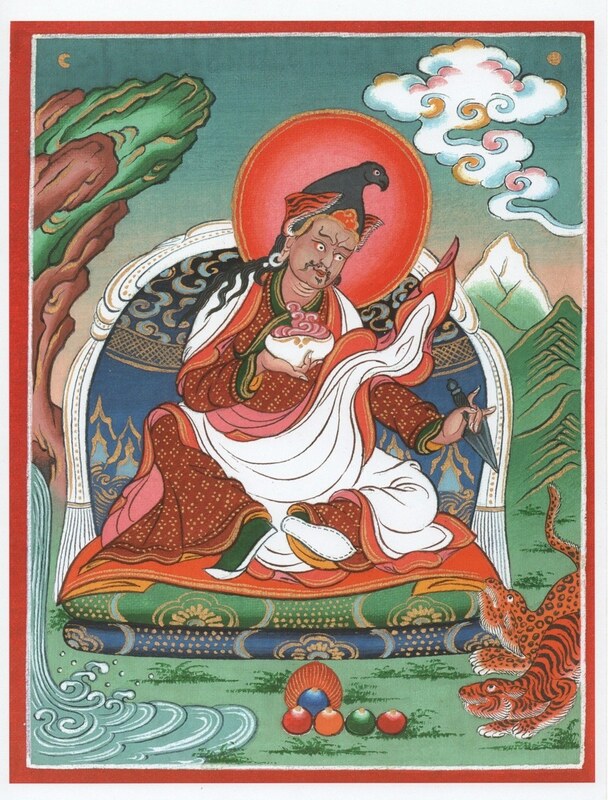 The foregoing text is from the introduction and first three chapters of Tsasum Lingpa’s autobiography, which is entitled Clear Garland Crystals of Fire.